With the increasing use of rotary evaporators, there are many merchants selling rotary evaporators on the market. Considering that everyone has some doubts when purchasing rotary evaporators, today I will give you some knowledge for purchasing rotary evaporators for your reference.Here’s the latest rotary evaporator product of 2019, which can be compared with the old one. 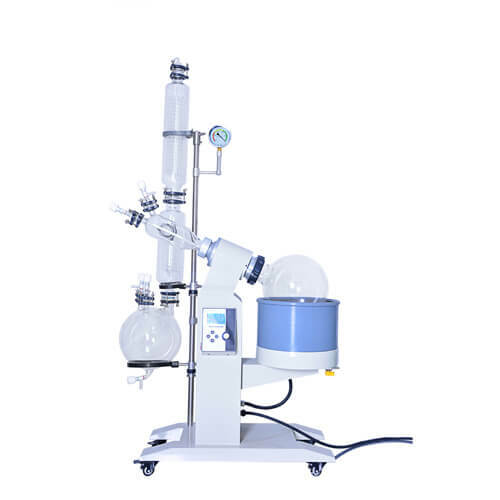 2019 new rotary evaporator, at present, our company has three types of 10L, 20L and 50L on the market.The new rotary evaporator has the following characteristics: The main body bracket is made of stainless steel + aluminum alloy, the structure is reasonable, and the materials are exquisite. All glass parts are made of high borosilicate glass (GG-17), which is resistant to high temperature and corrosion. The sealing system adopts two-way combined sealing of imported fluorine rubber and Teflon, with long corrosion resistance and high vacuum. 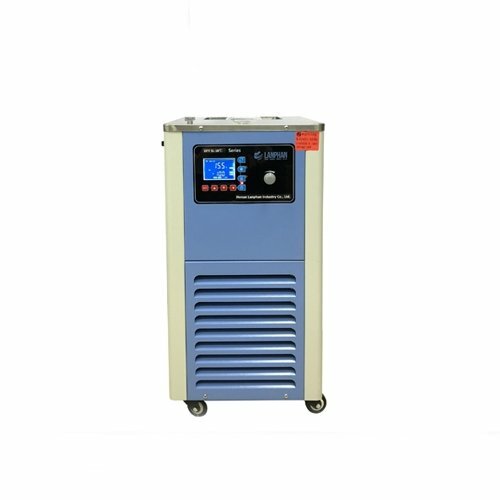 Vacuum pressure gauge display real-time vacuum and the oil-based meter has anti-vibration properties.Continuous feeding is convenient for customers. Valve type feeding valve is butted with PTFE pipe.The collection bottle is provided with discharge material for convenient collection and discharge of evaporated extract.Check valve control, continuous discharge, vacuum switching when the machine is in working condition. All valves adopt the latest one-piece handwheel valve, with good sealing performance and simple operation. 1.1.Vertical three-layer serpentine coil condenser, main cooling + sub-cooling double condenser to ensure high recovery rate . 2.LCD full-screen display, temperature and speed double digital display, bath intelligent thermostatic control, PT100 sensor transmits temperature quickly and accurately. 3.The pot is made of high quality 304 stainless steel, which is anti-corrosive and durable. The outer layer of the pot is covered with a silicone layer, which is safer to use at high temperature. 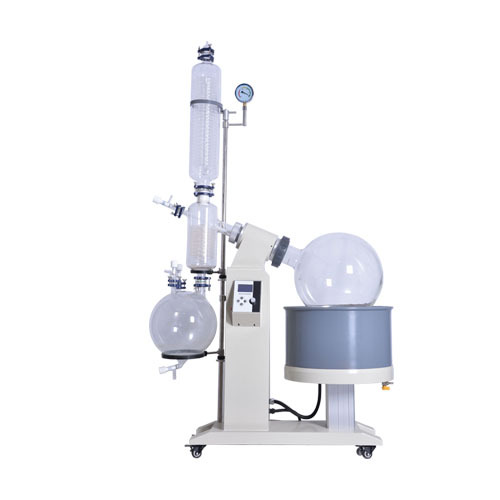 RE-5003 Rotary Evaporator is especially suitable for the concentration, crystallization, separation and solvent recovery of materials that are sensitive to heat sensitive materials and metal materials such as stainless steel.The instrument has large contact area, high evaporation efficiency, convenient to use, low noise, reliable sealing, and can handle easy foaming materials, complete specifications, including 2L, 3L, 5L, 10L, 20L, 30L, 50L, 100L and other specifications.100L rotary evaporator is a large-scale rotary evaporator that is exclusively developed by our factory, which is convenient for customers in actual large-scale production. 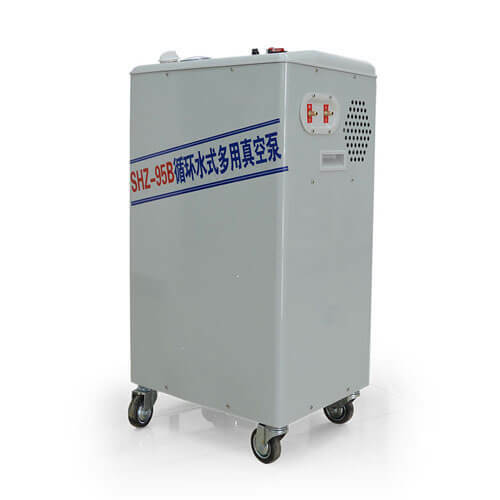 1.Intelligent digital display lifting type water and oil universal bath, stainless steel one-molding liner without welding, annular heating tube heating evenly, rapid heating rate. 2.High borosilicate glass once formed high efficiency serpentine condenser with good condensation effect and high recovery. 3.The PTFE combination rotary seal effectively maintains the high vacuum of the system. PTFE combined rotary seal effectively maintains high vacuum in the system. 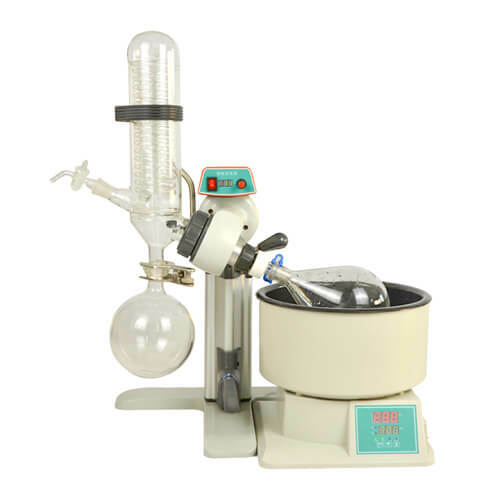 The RE-2010 Rotary Evaporator is electronically controlled to rotate the flask at a constant and suitable speed to increase the evaporation area. The evaporation flask is placed under a negative pressure state by a vacuum pump, and the evaporation flask is heated while being placed in a water bath at a constant temperature. The solution is heated, diffused and evaporated in a rotating flask under negative pressure. 1.Double digital display of speed and temperature to make you clear at a glance. 2.The new lifting rod design is easy to operate and the aluminum alloy material will never rust. 3.New type condensing tube design. 1.All glass parts are made of high borosilicate glass (GG-17), which is resistant to high temperature and corrosion. 2. The sealing system adopts two-way combined sealing of imported fluorine rubber and Teflon, with long corrosion resistance and high vacuum. 3. Vacuum pressure gauge display real-time vacuum and the oil-based meter has anti-vibration properties. 4. Vertical three – layer serpentine coil condenser，main cooling + subcooling double condenser to ensure high recovery. 5. Continuous feeding is convenient for customers. Valve type feeding valve is butted with PTFE pipe. Temperature display “Er-2”,ALM1 mark light Bath temperature sensor short or open circuit.